Susanne Hatje serves as the General Manager of the Five-Star Mandarin Oriental, New York, theGroup’s flagship property in The Americas. Ms. Hatje has more than 25 years of experience in the hospitality industry and has held senior management positions with Mandarin Oriental for the past 15 years. Prior to joining Mandarin Oriental, New York, Ms. Hatje served as Group Director of Residences, where she effectively managed all aspects of the Group’s global portfolio of Residences at Mandarin Oriental. Previously, she was the launch General Manager at Mandarin Oriental, Boston and The Landmark Mandarin Oriental, Hong Kong, where she successfully positioned the hotels amongst the top luxury properties in their markets, garnering numerous accolades for each. Ms. Hatje has also served as General Manager of Mandarin Oriental, Munich and Resort Manager at Kahala Mandarin Oriental, Hawaii. Earlier in her career, she worked in New York City as Assistant Manager of The Mark, New York when the property was part of Rafael Hotels Ltd.
My parents were both hoteliers in Hamburg, Germany where I was born and raised. Having quite literally grown up in the industry, I was able to learn the ins and outs of working in and running a hotel from a very early age. Tell us about Mandarin Oriental, New York. What inspired the idea and what is your vision for the hotel? Mandarin Oriental, New York offers guests an unbeatable setting in Columbus Circle overlooking Central Park, the Hudson River and the Manhattan skyline. As the Group’s flagship property in North America, the hotel honors the brand’s Oriental heritage while celebrating its New York City location. Complemented with the personalized service that Mandarin Oriental is known for, the property offers an experience unlike any other in Manhattan. We strive to offer each guest a memorable stay tailored to them with unique experiences, thoughtful programming and impeccable attention to the small details. What strategic partnerships/marketing strategies have you implemented that have attributed to Mandarin Oriental, New York's success? At Mandarin Oriental, New York, we seek to provide each of our guests with unique experiences and exciting programming, much of which is achieved through partnerships. On the social media front this year, we partnered with photographer Christian Chantemargue on our MyViewYork campaign, featuring images of both famous and unexpected views of New York City in an effort inspire visitors and locals alike to discover the city with a fresh perspective. New York City is one of the world’s fashion capitals and for the launch of our new suites this summer, we partnered with two renowned luxury brands. Our Bedside Reading Program has been curated by New York-based designer Joseph Altuzarra of Altuzarra and featured books have inspired the collections for his women’s ready-to-wear brand over the years. Suite guests will also be welcomed with a Rodarte New York City Guide upon arrival, designed exclusively for the property by award-winning designers Kate and Laura Mulleavy of Rodarte. The Rodarte New York City Guide is both a functional map of Manhattan and a collectible art piece that invites guests to explore the city through the designers’ eyes. From a culinary standpoint, we have featured two guest chef pop-ups in our signature Restaurant Asiate over the past two years with Michelin-starred chefs Eneko Atxa and Thierry Marx, which were incredibly successful. In addition, we host monthly wine dinners in the restaurant’s private dining room, showcasing both celebrated and more eclectic wine and champagnes. Travelers are looking to their hotels to be a destination authority. When traveling to cities like New York that they may have been before, they are seeking a sense of surprise and discovery of local culture. Social media also continues to play a major role in the guest experience. Keeping these trends in mind, it’s our job to continuously help guests uncover the hidden gems of the city. Through Mandarin Oriental, New York’s various social media programs such as MyViewYork, NYC You Inspire Me, and 365 Reasons We Love New York City, we have been able to share not only the property’s, but also New Yorkers’ favorite locations throughout the city with the hopes to inspire guests to travel to and explore the city in a new way. Mandarin Oriental, New York's Motto? To completely delight and satisfy our guests. Your greatest success as General Manager of Mandarin Oriental, New York? Most difficult moment-how did you overcome and what did you learn? I’ve been in the hospitality industry for more than 25 years and was excited when the opportunity to lead the team at Mandarin Oriental, New York presented itself. I began just over two years ago as the property was celebrating its 10th anniversary. In that short period of time, the property has been able to set the benchmark for superior service in the city. To this day, our colleagues remain passionate about creating unique experiences and lasting memories for each and every guest and I am proud of them for that. With that said, in my role as General Manager I must be a part of every facet of the business – whether finance, marketing or the rooms division. In today’s hospitality environment, balancing the needs of the operation with the expectation of the financial performance while simultaneously managing key relationships is both challenging and critical. Have passion for what you do, don’t fear making risky decisions and always continue learning. Describe the ideal experience at Mandarin Oriental, New York. Upon arrival to the hotel, guests are whisked to the Sky Lobby on the 35th Floor where they are welcomed with breathtaking panoramic views from floor-to-ceiling windows. After settling into their guestroom, I would first recommend that guests enjoy a bit of “sightseeing” during our Afternoon Tea in the Lobby Lounge. Here, they can enjoy an “east meets west” experience along with our famous ginger scones with Central Park and the city skyline as the backdrop. Next, I might suggest guests relax with a rejuvenating treatment, such as our new Jade Stone Facial or a signature Oriental Essence Massage, in our spa which is an oasis of calm high above the city. Then, guests should consider making it an evening of indulgence with our decadent six-course Tasting Menu with wine pairings at Restaurant Asiate featuring spectacular views of the city skyline followed by a nightcap and our Gratification signature cocktail in the comforts of MObar. After guests have woken up to the morning sun rising over Central Park, they should watch the light begin to change during the late afternoon while enjoying a swim in our 75-foot lap pool overlooking the Hudson River as a cruise ship passes by in the distance. How important are architecture/design to the success of Mandarin Oriental, New York? Mandarin Oriental, New York is best known for its spectacular views and the architecture and design of the property is key. No matter where you are in the hotel, whether it be a guestroom, spa or restaurant, the view of Central Park, the Hudson River or the city skyline takes center stage. Our new one- and two-bedroom suites which launch this summer have been designed and structured to maximize guests’ experience of the view with curved sofas and desks as well as upholstered beds facing the enveloping views. A great number of our colleagues have been with the property since opening nearly 12 years ago and remain committed to working together to delivering the best possible guest experience. As General Manager, I believe it’s important to constantly have an open dialogue with the team in the hopes that will continue to inspire innovation and a hunger for excellence and success. I also find it important to acknowledge a job well done and provide credit where it’s due. It would have to be a glass of champagne and white asparagus with béarnaise sauce, ham and new potatoes. Right now I’m making my way through Ben Mezrich’s latest, Once Upon a Time in Russia: The Rise of the Oligarchs-A True Story of Ambition, Wealth, Betrayal and Murder. I’ve always been a fan of his work and his newest book is especially thrilling. If Hawaii weren’t so far away, I would spend every weekend there surfing and relaxing on the beach. What's next for Mandarin Oriental, New York? This summer, we launched 42 restyled one- and two-bedroom suites at the property. Overlooking Central Park, the Hudson River and the Manhattan skyline, each suite reflects New York City life through the course of a day celebrating the city’s sunrise, dusk and nights. With an array of exclusive amenities and exciting partnerships, the suites take guests on a unique journey of the city to create an experience unlike any other in Manhattan. As we look forward, we remain committed to delighting and satisfying our guests by providing innovative experiences and passionate service. On numerous occasions, Ms. Hatje has been recognized for her leadership accomplishments. In 2008, she was named one of Boston Business Journal’s “40 Under 40” for establishing herself as a leader in the hospitality industry. In 2006, she was nominated for the “100 Masterminds of Tomorrow” exhibition sponsored by the German government to honor Germans who are shaping the future. 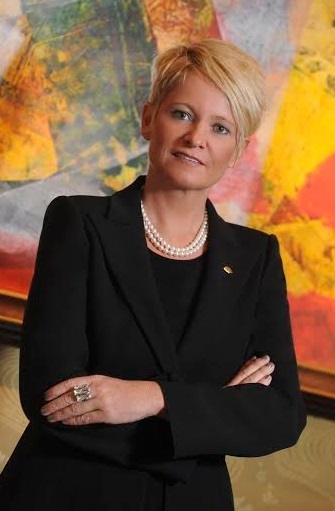 A German national, Ms. Hatje joined the hotel industry in 1988 as an apprentice at Atlantic Hotel Kempinski in Hamburg. While advancing her career, she continued her education through hospitality management programs at New York’s prestigious Cornell University and Australia’s Royal Melbourne Institute of Technology (RMIT) where she earned a Master’s of Business Administration degree. When she is not working, the action-loving general manager enjoys Pilates, surfing, sailing and tennis.